Home / Gossip / news / politics / ‘You Are Sabotaging My Assignment! !’ — Tinubu Slams APC Chairman, Oyegun! ‘You Are Sabotaging My Assignment! 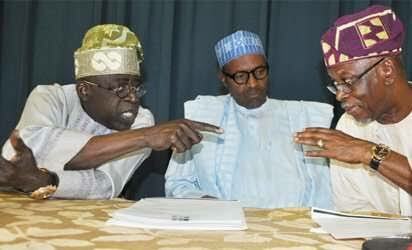 !’ — Tinubu Slams APC Chairman, Oyegun! The national leader of APC, Chief Bola Tinubu has written a scathing letter to the national chairman of the party, John Odigie-Oyegun, accusing him of sabotaging his job and the chairman of the newly constituted peace reconciliation assignment, TheCable can report. In the letter, dated February 21, 2018, the former governor of Lagos state said “disappointment greeted me when I discovered that you had swiftly acted in contravention of the spirit of our discussions. Instead of being a bulwark of support as promised, you positioned yourself in active opposition to the goal of resuscitating the progressive and democratic nature of APC”. Tinubu said while Odigie-Oyegun mentioned Kogi, Kaduna, Kano and Adamawa as places affected by serious party issues, “you have taken it as your own personal ambition to thwart my presidential assignment in these key states”. He accused the chairman of rushing to Kogi state to unilaterally inaugurate officials “parallel to the officials already heading the state chapter of the party”. “While this may place you in significant affinity with those parallel officials you handpicked, this machination suggests no improvement in the welfare of the party in Kogi or at the national level,” Tinubu wrote. The third republic senator said even if Odigie-Oyegun had personal qualms with him, it is his right as a human being but “you have no such right the chairman of this party… The party belongs to all of its members”. He asked the former governor of Edo state to refrain from taking any more “improper unilateral decisions with regard to the national and state chapters of the party”. He reminded Odigie-Oyegun that the assignment was given to him by Buhari, stating that “in furtherance… I request that you make available to me the status reports and all the pertinent information regarding the state chapters without further delay”. TheCable understands that Tinubu, who is supporting Buhari for a second term, is not comfortable with Odigie-Oyegun’s continued leadership of the party, although pro-Buhari governors have impressed it on the president that it was better to elongate Odigie-Oyegun’s tenure than risk a new convention that could further fracture the party. Tinubu’s relationship with Odigie-Oyegun has been on a downward trend since the APC primary election for Ondo governorship in 2016. Segun Abraham, thought to be Tinubu’s preferred choice, was defeated in controversial circumstances by Rotimi Akeredolu, who went on to win the governorship election.